A composite of the first images of Martian sites suggested by the public as part of a participatory exploration program with NASA's Mars Reconnaissance Orbiter. The eight images were released March 31, 2010. Full story. NASA?s most powerful camera at Mars has beamed home thefirst photos of the red planet that highlight areas hand-picked by the public forcloser looks. 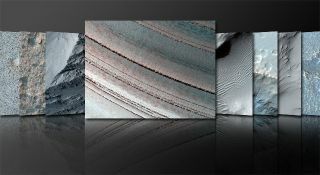 The new Mars photos, taken by the best camera on NASA?s Mars ReconnaissanceOrbiter (MRO) and released Wednesday, include eight images culled from nearly 1,000 suggestionssent in by the public for red planet postcards. "NASA's Mars program is a prime example of what we callparticipatory exploration," NASA chief Charlie Bolden said in a statement. "To allow the public to aim a camera at a specific site on a distant worldis an invaluable teaching tool that can help educate and inspire our youth topursue careers in science, technology, engineering and math." Some of the new photographsof Mars include snapshots of surreal landscapes strewn with boulders androcks, while others reveal collapsed sections of Olympus Mons ? the largestvolcano in the solar system. Martian ice sheets, dunes, mesas and other featureshighlight the other photos. Scientists used the High-Resolution Imaging ScienceExperiment (HiRISE) camera on the MRO spacecraft to take the new Marssnapshots. The photographs were taken as part of the HiWish project, which begancalling for public suggestions in January and is organized by a science team runningthe HiRISE camera at the University of Arizona in Tucson. "What we hope is that people become more interested inscience and appreciate this opportunity to explore another world," saidAlfred McEwen, principal investigator for the camera at the University ofArizona in Tucson. "We appreciate fresh thinking outside the box and lookfor things we may not have chosen otherwise. It's good to have a lot of eyes onMars." The MROspacecraft is NASA?s youngest Mars probe, but the most prolific in terms ofred planet photography and observation. It has beamed more photos and observations of Mars to Earth than all other missions to the red planet combined, NASA officials have said [MRO's data flood explained]. Since it arrived at Mars in 2006, the spacecraft has takenmore than 13,000 photos with its main HiRISE camera. While that sounds like alot, it is actually just 1 percent of the entire surface of Mars. NASA is hoping the public will have some choice targets tostart mapping the remaining 99 percent of Mars? surface. That hope, itappears, may be well-founded. "Some people get into model railroading or Civil Warre-enactments. My thing is exploring Mars," said James Secosky, a retiredteacher in Manchester, N.Y., who suggested a target for HiRISE imaging after studyingphotos taken by other Mars-orbiting cameras that were posted online. Another NASA probe, the Mars Odyssey orbiter (which is olderthan MRO), has taken nearly 500 photos of the red planet based the 1,400suggestions sent to its science team from the public since 2009.